A historical moment for Mauritius and Chagos. 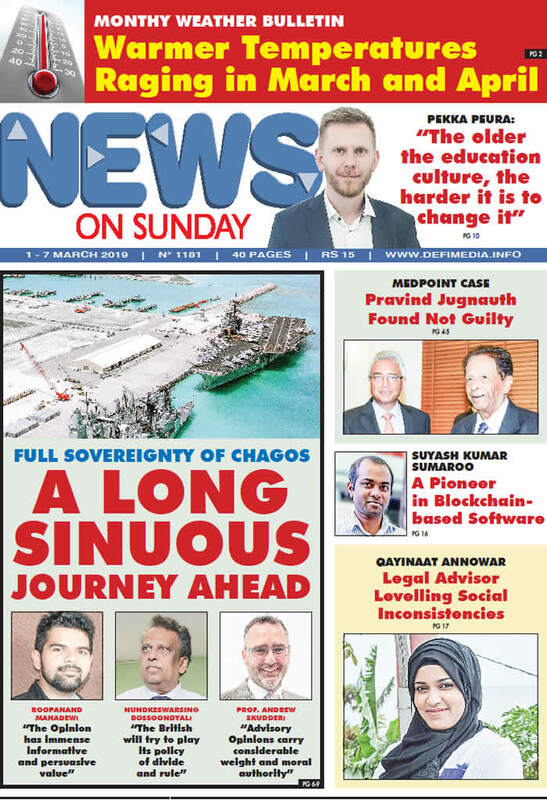 The Advisory Opinion from the International Court of Justice in favour of Mauritius has finally answered the prayers of a subjugated nation for 50 years, and now, there is a beacon of light for the Chagos community. However, this new hope is just a stepping stone for the long fought battle. Observers and jurists in unison agree that this Advisory Opinion is just the start of a long pathway to be covered. There is also the question of what could be the consequence of this Advisory Opinion on our relations with the UK and the US. What is the next step for Mauritius? The Meteorological Services emitted its monthly weather bulletin on Wednesday. It is stated that January 2019 was in general warm and dry for most part of the month. However, the rain recorded at the end of the month was significant enough to bring the mean monthly rainfall recorded islandwise to 259 mm which is 99 % of the normal. Principal at Startup High school, a Finland based online platform that provides virtual entrepreneurial studies for all high school students, Pekka Peura is an advocate for future learning. Known as ‘the most famous teacher in Finland’ for his innovation and leadership development work receiving a Mensa Award, his influence has in fact encouraged fellow educators to join him in the long-term development goal to shape the future of education. Present in Mauritius for the B.O.L.D (Breaking Ordinary Learning Dimensions) summit organised by the African Leadership University, Pekka Peura shares with us his vision for the future of education. The Prime Minister and leader of the MSM has been exonerated from all blames by the Judicial Committee of the Privy Council (JCPC) in the MedPoint case. Following the announcement of the ruling on Monday 25th February, besides celebrations by key personalities, members of the MSM party and by Pravind Jugnauth himself, many stakeholders reacted to the judgement, including the Office of the Director of Public Prosecutions (DPP). Driven by the passion of technology, Suyash Kumar Sumaroo, Director of Codevigor Ltd, was awarded the first runner-up of the Creative Young Entrepreneur Award 2018. A pioneer in providing generic Blockchain-based software development services in Mauritius, the entrepreneur is willing to make his company the leading technological enterprise in the Indian Ocean. Conflicts exist in all the areas of life. In a world where siblings are fighting among themselves for properties left behind by elders, while colleagues are in constant disagreement and employees are suing their employers for harassment, Qayinaat Annowar is striving hard to promote peace and understanding with the art of mediation.